Over 5,000 Senecas have been produced in over 40 years of production, and they are still rolling off the line today. The Piper PA-34 Seneca has a fairly interesting development history, starting out as a tri-motor and now serving as a popular light twin-engine commuter aircraft. The current Seneca V model is a low-wing, six-seat aircraft equipped with retractable gear and two Continental TSIO-360-RB turbocharged engines. It is one of the few remaining piston multis in aviation today. Piper Aircraft, which has been around since the late 1920’s and perhaps best known for the Piper J-3 Cub, started producing multi-engine aircraft in the 1950s starting with the PA-23 Apache. Piper followed this up by taking their PA-24 single-engine Comanche and making it a twin-engine variant, the PA-30 Twin Comanche. Not too long after that, Piper took their popular PA-32 Cherokee Six, installed a 115 hp Lycoming O-235 on each wing (leaving the engine on the front), and flew this new tri-motor PA-32-3M. This aircraft was largely experimental though and only one prototype was built. Piper still wanted to develop the Cherokee Six into a multi-engine variant, so they next built a twin-engine prototype, the PA-34-180. This aircraft, dubbed the Twin Six, would go through three variations between 1967-1969. By the time the third prototype was produced, the wingspan was increased two feet, retractable gear was added, and the engines upgraded to the 200 hp Lycoming O-360-A1A. This prototype became the Seneca I when it received its FAA certification in 1971, and production began late that year. Almost 1,000 of these aircraft were produced over three years, and in this time the company received numerous complaints about the handling characteristics – sluggish and some pilots noted lateral oscillations. This prompted Piper to design the PA-34-200T Seneca II, with the “T” designation coming from the introduction of the turbocharged 200 hp Continental TSIO-360E engines, giving the Seneca better performance at high altitude. This model, introduced in 1975, had a greatly improved flight control system that took care of all prior complaints. Piper Aircraft would add one more model to the Seneca line in 1981 before going bankrupt. The PA-34-220T Seneca III upgraded the engines to the Continental TSIO-360-KB, now with 220 hp for even better performance, and included three-blade props. 930 Seneca IIIs were produced before Piper Aircraft filed for Chapter 11 bankruptcy in 1991. Piper was determined to come out of bankruptcy. 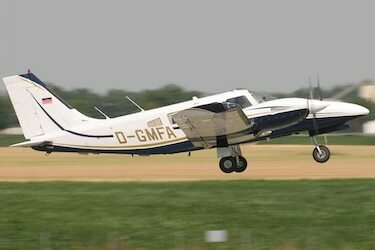 They continued operations and in 1993 introduced the PA-34-220T Seneca IV. Though the Seneca IV only looked slightly different than the Seneca III with a redesigned instrument panel, leather interior, and more streamlined cowlings, the rest of the aircraft was more or less the same. But Piper now offered “standard” in the Seneca IV what was previously optional equipment in the Seneca III. “Standard” now included deicing equipment and an improved navigation & flight director. The enhanced, upscale interior and deicing equipment made this a popular aircraft for small charter operations and businesses in cold, northern climates. It could be said that the Piper IV helped the company survive their bankruptcy. The Seneca received one more boost in 1996 with the PA-34-220T Seneca V. New engines, the TSIO-360-RB, were now fitted with automatic wastegates, easing pilot workload. The cowlings went through one more redesign, improving the aerodynamics though the performance specifications haven’t changed much since the Seneca III. One of the unique things about the Seneca is the right engine – it’s counter-rotating, offsetting the effects of adverse yaw and eliminating critical engine limitations. 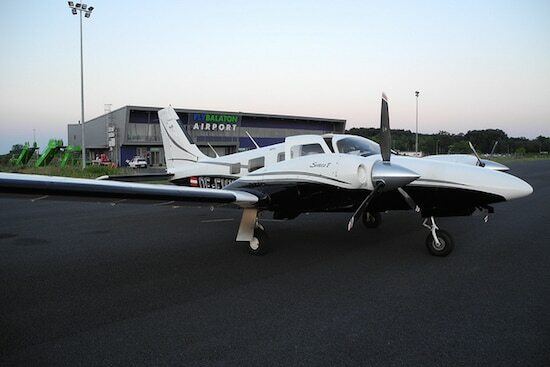 In fact, the later Seneca models perform quite well in single-engine situations. Despite being a fairly heavy “light twin”, it still maintains a 240-fpm single engine climb rate with a service ceiling of a mighty 16,500’. The Seneca is a favorite for short field operations, often utilizing less than 2,000’ for both takeoff and landing. It’s quick to jump off the runway at 65 knots and can hold an initial climb rate of almost 1,500 fpm. Most pilots will hold 1,000 fpm up to cruise altitude though. The Seneca isn’t exactly crisp to respond to the controls, and it flies like a heavier aircraft, but it is smooth and stable. Most configuration changes will require a noticeable change in trim, and this holds true throughout the entire Seneca lineage. Pilots will love the modern cockpit of the Seneca V. The instrument panel is a nice aluminum finish instead of the black plastic you’ll find on many older aircraft. With the Garmin G1000 navigation suite standard, big 10-inch glass displays dominate both sides of the cockpit and will present flight instruments, moving maps, approach plates, and weather. Some of the switches have been moved to the headliner above the pilot, adding to the “corporate jet” feel. Visibility leaves a little more to be desired, with the engines taking up most of the pilot’s peripheral vision. The Seneca is mostly used for small charter operations and as business commuters due to low operating costs. Passengers will be able to easily enter the aircraft through a big, low barn door (also makes loading cargo easier!). Once inside they’ll be very comfortable in the soft leather seats, arranged in a club configuration with the middle row facing aft and plenty of space in the middle for legroom. Older Senecas had a useful load of 1,700 pounds but with everything that has been added up to the Seneca V, loads of 1,400 pounds will put you at the limits. With a full load of passengers, the Seneca is limited to approximately 50 gallons of fuel – burning around 24 gph at cruise, this gives the Seneca 90 minutes of flight time with a 30 minute fuel reserve. Cruising at 188 knots yields a range of 280 nautical miles – the configuration you’ll find limiting most charter operations. Otherwise, the Seneca has a max range of 828 nautical miles. Baggage payload can be smartly divided between the nose and aft compartments for optimal loading. with fixed wastegates, set to 40 inches of manifold pressure. Well, at sea level, you’ll reach this limit approaching half throttle. Overboosting could be a problem if you weren’t cautious about your throttle position; a relief valve was set to 42 inches. Tending to the mixture inflight required some attention, as even the smallest change would result in large manifold pressure changes. The Seneca V addressed all of this by using the TSIO-360-RB engines equipped with automatic wastegates and an intercooler, eliminating the possibility of overboosting. The critical altitude, where the engines start to lose power, is 19,000’ but the service ceiling of the aircraft is 25,000’ – you’ll need supplemental oxygen at these altitudes, so in most scenarios you’ll have more than enough power. Over 5,000 Senecas have been produced in over 40 years of production, and they are still rolling off the line today. It’s a true testament to the design that this aircraft has survived not only a bankruptcy but also a giant change in the aviation industry where most manufacturers are abandoning piston twins and opting for turbine singles. The aircraft is also manufactured under license in Brazil as the Embraer EMB-810 and in Poland as the M-20 Mewa. Piper PA-34-220T Seneca V’s run around $750,000 new, depending on options.